Great White Sharks have a bad reputation with swimmers and other ocean dwellers. You can thank Mr Steven Speilberg's Jaws film, the 3 sequels and few bad rip offs for that. The kids film Finding Nemo finally showed that Great White's had been horribly misaligned as the oceans's bad boys. Bruce's line, "Fish are friends, not food" proved almost beyond doubt that these sharks were indeed friendly. Now an ocean photographer, Amos Nachoum, has shown the Jaws was wrong and Nemo was indeed right. Great White Sharks are friends! 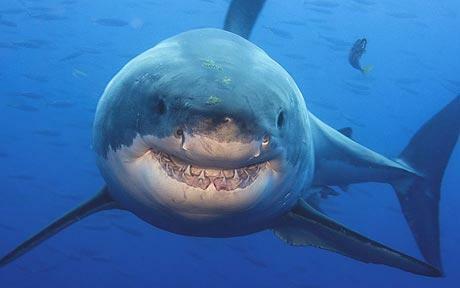 Check out this picture of a supposedly 14 foot Great White appearing to smile for the camera. Those razor sharp pearly whites seem especially friendly! The shark was snapped in this unusual pose near Guadalupe Island off Mexico's Pacific coast. Maybe he just wanted the diver to check for baby seal in his teeth? Check out this orca whale flipping a pseudo orca in the air!